In a liberal democracy law making should be a transparent affair. Transparency allows constructive public debate before a law is imposed on the society. In USA, the secrecy surrounding the drafting of the Senate Health Care bill meant to repeal Obamacare has been widely criticised. In contrast, we in India are so used to secrecy in legislative drafting that we do not even question it. We are content that bills introduced in the Lok Sabha and Rajya Sabha are at least publicly available. There had been speculation in the media since March 2017 that the Government was planning to take steps to resolve the stressed assets problem in the banking sector. The graph above plots data from Google Trends. It shows the interest over time in the words 'NPA Resolution'. 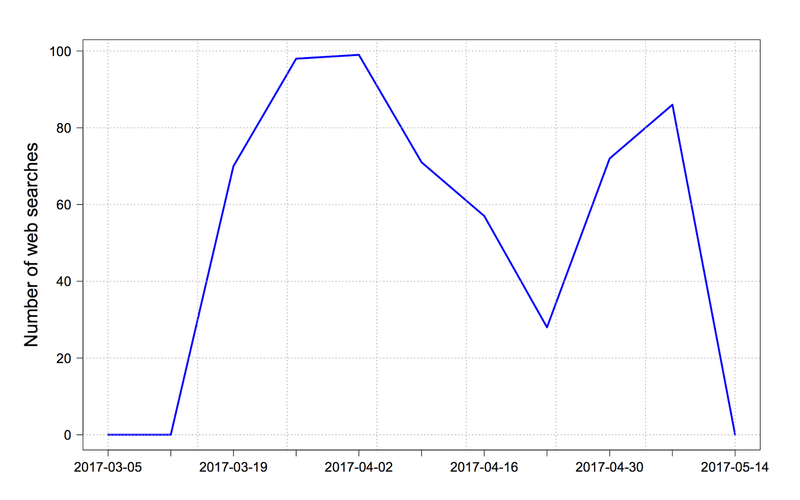 The graph plots the number of web searches done between the weeks starting March 5, 2017 and May 14, 2017. From March 19 onward, there was a sharp increase in the number of searches that used the words 'NPA Resolution'. The interest subsided in the week starting April 23 and picked up significantly in the week starting April 30, the same week when the NPA ordinance was first announced and then publicly released. From March 2017 onward, there were also news in the media that the Government was planning to empower the Reserve Bank of India to deal with stressed asset problem (see here and here). On May 3, 2017 the Cabinet approved the Banking Regulation (Amendment) Ordinance, 2017. The media carried reports about the Cabinet approval but the text of the draft ordinance was not publicly available (see here and here). Around 7:49 pm on May 3, 2017, the Finance Minister mentioned in a media briefing that the Cabinet's recommendation has been sent to the President. He did not disclose any further detail on the ground that: There is a convention that when some proposal is referred to the President, then details of it cannot be disclosed till it is approved (sic). On May 4, 2017 the President signed the Ordinance. The text of the signed ordinance was still not publicly available. On May 5, 2017 the ordinance was released in public domain when it was uploaded onto the e-gazette at 12:38 PM. In other words, even after the Cabinet approval on May 3, the text of the ordinance was withheld from the public till May 5. What was the impact of this secrecy convention? In this post we answer this question by examining the movement of the Nifty, the Bank Nifty and the PSU Bank Nifty indices before and after the public release of the ordinance. was much speculation in the media about the details of the proposed ordinance. 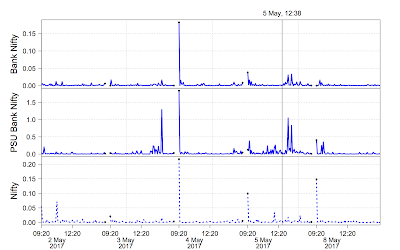 The graphs above plot the three stock indices for the trading days around May 5. They run from the start of the trading day on May 2 to the close of trading on May 8. Trading was closed on the weekend of May 6 and May 7. The first two graphs from the top show the cumulated market model residuals of the Bank Nifty index and the PSU Bank Nifty index, respectively. The bottom-most graph shows the movement in the Nifty index around the event. The event identified in the graphs is the public release of the NPA ordinance at 12:38pm on May 5. After the Finance Minister's press briefing on the evening of May 3, Nifty traded higher on May 4 than on the previous two trading days. Right after the ordinance was made public at 12:38pm on May 5, it fell till about 1:40pm before correcting marginally and ended the day lower than the previous two trading days. A similar price movement is seen in the Bank Nifty index. The movement is much more pronounced in the PSU Bank Nifty index. 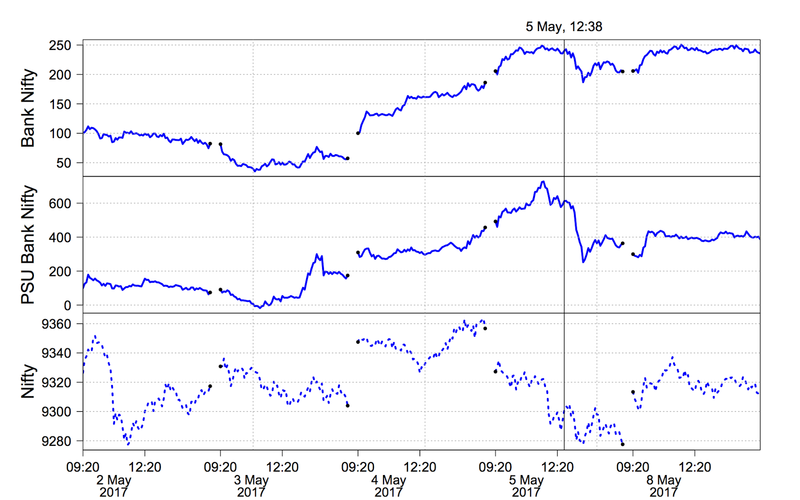 Both the Bank Nifty and the PSU Bank Nifty indices went up between May 3 and May 5 (before 12:38 pm), the time period during which the secrecy convention was supposedly being followed. 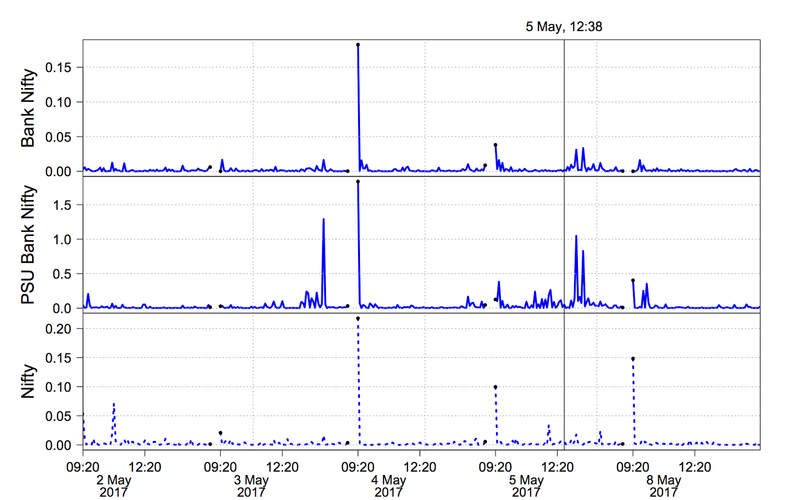 This suggests that the Finance Minister's media briefing on the evening of May 3 and the selective release of information was treated as positive news by the market. However the upward price movement came to a halt when the full text of the NPA ordinance was made public at 12:38pm on May 5 following which the prices fell sharply. The decline was more pronounced for the PSU banks. It is worth noting that the prices had actually started falling a little before 12:38pm on May 5, particularly for the PSU banks. So it is possible that news of the text of the ordinance got leaked to the market even before the official release of the ordinance. The graphs above show the volatility in the returns of the three indices around the release of the NPA ordinance. There was an increase in the volatility of both the Bank Nifty and the PSU Bank Nifty indices after the ordinance was made public on May 5. The volatility increase was much more prominent for the PSU banks. The negative reaction of the market following the public release of the ordinance reflects the mismatch between market expectations and the final text of the ordinance. Between May 3 and May 5 (before 12:38 pm), market expectations were fuelled in the absence of the full text of the proposed ordinance. The selective release of information by the government triggered expectations in the market that the proposed ordinance would offer a comprehensive solution to the stressed asset problem of the banking sector. However, once the text of the ordinance was made publicly available at 12:38 pm on May 5, it was not evident to the market how the ordinance would be able to tackle the NPA crisis. The ordinance gave rise to more questions than it answered (see here). Consequently, the market reacted negatively. Secrecy has been an inherent trait in ordinance-making since the times of the British Raj. Post-independence, while giving ordinance making powers to the President, the Constitution framers did extensively deliberate on the potential misuses of such powers. But they never questioned the secrecy around ordinance making. Consequently, Article 123 of the Constitution empowers the President to promulgate ordinances but does not explicitly require transparency in the ordinance-making process. It is then hardly suprising that even the Supreme Court has over time accepted that open legislative debates and discussions do not apply to ordinances. It is high time we question this secrecy. As we have seen above, the secrecy convention coupled with the discretionary release of partial information about the recent Banking Regulation (Amendment) Ordinance, 2017 led to information asymmetry in the stock market, causing market inefficiencies. To avoid such inefficiencies, the government should make the ordinance-making process transparent by discarding the age-old secrecy convention and officially releasing the proposed ordinance immediately after it is approved by the Cabinet. Complete transparency in ordinance-making will also be in sync with the broader philosophy of legislation-making in a modern liberal democracy. What happens to private airlines when Air India is privatised? What's the impact of privatising Air India upon the rest of the domestic airline industry? Some think that the capital stock of Air India will now be put into more capable hands, and that will intensify competition. Instead of a feeble competitor with assets of Rs.546 billion, we'll have a strong competitor wielding those same assets. As was argued by me in August 2009, the `zombie firms' literature helps us think about this. A zombie firm is one which ought to go out of business, but is artificially kept on life support. Sometimes, the subsidy is explicit, such as the fiscal injections into Air India. Sometimes, the subsidy is less visible, such as banks extending additional capital to bankrupt firms. Regardless of the method adopted, the basic fact stands: A firm that ought to have gone out of business was given a subsidy through which it sold goods at below cost. To fix intuition, imagine a market price of Rs.100. Imagine a weak firm that, on its own, is only able to produce at Rs.110. This firm ought to rapidly vanish. But instead, it's given a subsidy of Rs.11 (either by the government or by banks) and it manages to sell at Rs.99. This keeps it going. This also harms the healthy firms in the industry, who have to deal with competition from this dead man walking. Turning to Air India, in 2014-15 the firm produced a profit after tax that was -28.4% of total income. For each Rs.100 of total income, there was a loss of Rs.28.4. The overall industry was at -11.7%, and the industry average was dragged down by Air India which is a substantial player. The presence of zombie firms harms healthy firms. It's hard for a healthy firm to compete against one that's getting a subsidy. By this logic, the exit of a zombie firm is good news for each firm left standing in the industry. If one of the incumbent large Indian airlines buys Air India, the combination will have significant market power, which would be a suboptimal outcome. It would be nice, from the viewpoint of competition policy, if a new player buys Air India. In either event, the low and subsidised prices charged by Air India will end. This will improve the profitability of the domestic airline industry. All healthy firms benefit when we address the problem of zombie firms. Air India's privatisation is an interesting milestone where we may see some of these effects play out. The issue of zombie firms is, of course, present in many parts of the Indian economy. We have a peculiar arrangement where zombie banks keep zombie firms alive. Disrupting these arrangements holds the key for starting India on the next bout of growth. On June 14th, the Union Cabinet approved the proposal to introduce a Financial Resolution and Deposit Insurance Bill, 2017 ("the FRDI Bill"). This is an important step forward for a critical component of the overall strategy of India's financial sector reforms. Shaji Vikraman has insight on this in the Indian Express. In this article, I look deeper into the concept of the resolution corporation, why it matters, how we got to this milestone, and what comes next. The slow unfolding of the banking crisis reminds us of the fragility of our financial system. The financial system, especially the banking system, is generally disaster-prone. On one hand, financial firms can make mistakes and experience losses. In addition, there is a link between problems of the economy and hardship in financial firms. When an economic downturn happens, the value of business activities declines, and this induces losses upon financial positions. We need to build a financial regulatory apparatus which will reduce financial fragility. This involves three main elements of machinery : micro-prudential regulation (which aims to push the failure probability of each financial firm to a desired value), systemic risk regulation (which aims to reduce the probability of a disruption in the overall financial system, and have tools to respond to such a disruption when it does arise) and resolution (a specialised bankruptcy process for most financial firms). At present, in India, we have weaknesses on all three elements. When micro-prudential regulation works well, the failure probability of financial firms is at a low level chosen by the relevant financial agency. The failure probability is not zero. Failure of inefficient firms is essential for `creative destruction'. The process of failure of inefficient firms, and the shift of capital and labour to efficient firms, is essential for productivity growth. The question is: How can we make the failure of financial firms orderly? The failure of financial firms can often be quite disorderly. Unlike real sector firms, many financial firms manage a large amount money belonging to households and businesses, with only a small amount of capital brought in by their owners. Banks in India typically have leverage of 18$\times$ to 20$\times$, which means that their balance sheet size is 18 to 20 times the amount of equity capital. Such leverage is never seen with real sector firms. When the firm gets into trouble, there is clamour by the creditors who want to see a fair and efficient process through which they get some of their money back. Matters are more challenging with some financial firms which are so large and complex that their failure could induce instability in the financial system. Consumers of failed financial firms suffer. As an example, in India, many cooperative banks fail every year. In spite of high entry barriers, larger institutions also fail (e.g. Global Trust Bank in 2004). Consumers lose money in these failures. These bad experiences make consumers wary of engagement with the financial system, and increase the share of gold and real estate in their portfolios. Financial stability is threatened, because even if one systemically important financial firm fails, the entire system could be destabilised by a messy, long-drawn bankruptcy process. This forces government to bail out such financial firms. So, a financial crisis ends up having a fiscal consequence. When faced with the possibility of harm to consumers, and threats to financial stability, governments get cold feet in situations of firm distress. They are then prone to bail out financial firms using taxpayers' money. We in India are familiar with this story. Public sector banks are routinely recapitalised with public funds to ensure they do not fail. This is almost never a good use of public money. Regulators sometimes respond to these problems by setting up entry barriers, which harm competition and economic dynamism. They justify the every day harm to competition on the grounds that this averts harm to consumers, risks to financial stability and the fiscal cost of bailouts. Financial firms suffer from moral hazard, and take greater risks. At its worst, financial firms obtain supernormal profit from these two interlinked channels: the certainty of being bailed out and the lack of competition. A system that ensures quick and orderly resolution of failed financial firms can help avoid these outcomes. The system should be such that government, financial firms and consumers believe that the failures will be orderly. The present system of resolution in India is inadequate. First, it mostly empowers the respective regulators (eg. RBI for banks) to do the resolution. Since regulators give the licenses and are supposed to ensure safety and soundness of the firms they license, they tend to be tardy in acknowledging their mistakes. This regulatory forbearance leads to delays in recognition of failure, which increases the costs of resolution, and may lead to losses for consumers and increases risk to stability of the financial system. There is a conflict of interest between micro-prudential regulation (achieving a target failure probability for a financial firm) and resolution (gracefully closing down financial firms which are nearing failure). Second, the present system gives very limited powers of resolution. The powers that are given are: forced mergers/amalgamation, and winding up. Some of the other powers, such as bail-in (discussed later), are not available. Third, even these limited powers are not enjoyed over many of the financial firms. For example, regulators do not have resolution powers over public sector scheduled commercial banks and regional rural banks. Fourth, the way the system is structured, a bankruptcy resolution can take years, sometimes even longer than a decade. This is partly because the regulators do not have powers to take timely resolution action. Indian policy thinking on this began in the RBI Advisory group on reforms of deposit insurance, 1999, chaired by Jagdish Capoor. This slumbered until we got to the Financial Sector Legislative Reforms Commission, chaired by Justice BN Srikrishna, which worked from 2011 to 2013. In its full design of Indian financial regulation, it recommended a Resolution Corporation. In 2014, a Working Group of Ministry of Finance and Reserve Bank of India, co-chaired by Shri Arvind Mayaram and Shri Anand Sinha, also recommended a resolution capability for financial firms. In 2014, the Ministry of Finance constitued a Task Force for the Establishment of the Resolution Corporation, under the chairmanship of Shri M. Damodaran, to work out the plan for establishing the Resolution Corporation. This was part of the two-part creation of task forces for building the new institutions required in the FSLRC architecture, which came about as four task forces followed by one more. The budget speeches of 2015-16 and 2017-18 announced a plan to draft and table a Bill on resolution of financial firms. In September, 2016, a draft of the Bill was placed in public domain for comments. On June 14th, the Cabinet approved the proposal to introduce a Financial Resolution and Deposit Insurance Bill, 2017 ("the FRDI Bill") in Parliament. The FRDI Bill, when enacted, will create a framework to ensure that failure of financial firms is orderly. It will establish an independent Resolution Corporation tasked with resolving failed financial firms. The Corporation will also subsume the deposit insurance function presently performed by the Deposit Insurance and Credit Guarantee Corporation. This Bill stands at the intersection of two long-term reform projects: 1) financial sector reforms, of which bankruptcy resolution of financial firms is an integral part; 2) bankruptcy reforms, of which financial firm resolution is an integral part. So, this Bill moves both these projects forward, and is an important building block for an efficient system of capital allocation in India. FSLRC had envisioned a separation between the resolution corporation, which would apply for most financial firms, and the bankruptcy code, which would apply for the remaining financial firms and for all non-financial firms. The Bankruptcy Legislative Reforms Commission (BLRC), which drafted the Insolvency and Bankruptcy Code (IBC), worked with this scheme. IBC does not cover financial firms, unless the Central Government notifies certain financial firms to be covered under that law. Many types of financial firms, especially firms handling consumer funds and firms that are critical for financial stability, require a specialised resolution mechanism. For firms handling consumer funds (eg. banks, insurance companies), the process under IBC is not suitable, as a large number of small value consumers will find it difficult to invoke that process. The processes of IBC are designed for creditors who are firms, not individuals. For systemically important financial firms (eg. central counterparties, larger banks), a creditor-led resolution process under IBC is not suitable, because what is at stake is not just the interest of creditors but the stability and resilience of the financial system. Hence, for such financial firms a specialised resolution regime is required. The FRDI Bill will create such a specialised resolution regime. In the world of financial firms, resolution complements regulation. Regulators and the Corporation are expected to work in tandem, with the regulators focused on maintaining financial health and, when a firm gets into trouble, pushing for its recovery. The Resolution Corporation will take over and resolve a firm after recovery efforts have failed. Although the version of the Bill approved by the Cabinet is not yet in public domain, based on the version that was released for public consultations last year, the framework is divided into four stages. First, when the financial firm is healthy, the respective regulators will monitor the firm and work to ensure it continues to stay healthy. At this stage, the Resolution Corporation will only get information indirectly through the regulators. Substantive powers to monitor the firm or to take any other action with respect to the firm will not be available to the Corporation. Second, once the financial firm starts deteriorating, the respective regulator will attempt recovery. At this stage also, only the regulators will continue to have substantial powers over the firm. Third, if the recovery efforts fail, and as the financial firm get close to failure, the Corporation will get substantial powers to instruct the firm to improve its resolvability and prevent actions that may erode the values of assets available for resolution. At this stage, the role of regulators is restricted. Finally, when the firm fails, the Corporation will take charge and resolve it. Resolution typically means selling the failed financial firm, as a whole or in parts, to another financial firm via a competitive bidding process. However, resolution could also involve other instruments. For example, the firm could be "bailed-in", which means that the rights of and obligations to creditors may be written down to recapitalise the firm from within. Bail-in typically includes converting some junior debt into equity, but may also include writing down other types of claims. This is the opposite of a bail-out, wherein outside investors rescue a borrower by injecting money to help service a debt. Finally, liquidation may be a tool used for resolution. There is a certain degree of tension and potential conflict between the Regulators and the Resolution Corporation. This is a healthy check-and-balance. Resolution works as a check on regulatory incompetence and forbearance. Both sides will need to be mature, respect the role of the other, and coordinate. The idea of a specialised resolution regime for financial firms is well-accepted globally. The US has had a resolution system for banks for more than 80 years. The scope of this system was extended after the financial crisis of 2008. There have been more than 600 bank failures in US since the crisis. In this time, there has been not been even one bank run in the US, because depositors trust the resolution system to work. Why the crisis happened in the first place is another matter, which is beyond the scope of resolution. Resolution comes into play only after regulation fails, and the occurrence of crisis resulted from regulatory failure, among other factors. Many other countries have put in place comprehensive resolution systems. These include: all European Union member states, Switzerland, Australia, Canada, Japan, Korea, Mexico, and Singapore. Many jurisdictions have ongoing or planned reforms to resolution regimes. These include: Australia, Brazil, Canada, China, Hong Kong, Indonesia, Korea, Russia, Saudi Arabia, Singapore, South Africa, Turkey. We are still a few years away from having a full-fledged resolution regime. Now that the Bill is going to the legislative branch, it remains to be seen what version of the Bill eventually gets enacted. If the essential features of a good resolution regime are diluted in the final version, the chances of success will be low. Even after the Bill gets enacted, it would still take some time to build an independent and competent Resolution Corporation. Since this capability currently does not exist in the system, it will have to be cobbled together, and then strengthened over a period of time. Consider the example of human resource strategy. There are many models out there. While the Canadian authority works with fewer than 100 employees, the US authority has more than 10,000 employees. The Corporation could choose to run a tight ship, and rely on contractual work to scale up capacity in times of crisis, or it could choose to build a large organisation that is able to, on its own, deal with a crisis. Similarly, given the skill sets required to do this job, the Corporation will have to think innovatively about attracting top talent within the constraints of a government agency. The Task Force on Establishment of the Resolution Corporation, led by M. Damodaran, has done considerable work that lays the groundwork for constructing the agency. The implementation of their project planning needs to commence immediately, so that the delay between enacting the law and enforcing it can be minimised. It will also take our governance system some time to get used to this kind of a system of taking over and resolving a failed financial firm in a decisive and quick manner, as opposed to the present approach of allowing things to linger on. If things do go right, there are many potential benefits of this reform. The author is a researcher at NIPFP. DAKSH is a Bangalore based organisation working on judicial reforms using quantitative and legal-empirical methods. We focus on judicial process, procedures, management, administration and capacity building. Visit www.dakshindia.org for more details. We have an opening for the position of Research Associate at Bangalore. We are looking for graduates in law or public policy with 2-5 years post qualification experience. Candidates with experience or interest in inter-disciplinary legal research. Experience with litigation or consulting / advisory experience would be an added advantage. Candidate will work in a collaborative, non-hierarchical and open environment on a unique project with a judicial body. Salaries will be competitive and commensurate with experience, as per social sector standards. Firms are fearful as uncertainty has gone up by Ajay Shah in the Business Standard, June 12, 2017. Time for reflection, fellow doctors by Vikram Patel in The Indian Express, June 10, 2017. There is a similar problem with lawyers. Comey Drama A Reminder Presidential Disaster Often Hits In Times Of High Confidence by Ron Elving in NPR, June 9, 2017. How to Write Like James Comey by Beth Skwarecki in Lifehacker, June 8, 2017. The Comey statement. The Bounty Hunter of Wall Street by Jesse Barron in The New York Times, June 8, 2017. We need to careful to ensure that IFC market abuse, and laws about freedom of speech, do not interfere with such activities, which the richest 1000 families of India dislike. Presstitute chronicles by Pratap Bhanu Mehta in The Indian Express, June 7, 2017. Conspicuous consumption is over. It's all about intangibles now by Elizabeth Currid-Halkett in Aeon, June 7, 2017. Smart policing and safer streets start with better data; this is not the norm in India by Neha Sinha, Avanti Durani, and Rithika Kumar in Hindustan Times, June 7, 2017. Aadhaar's potential for financial inclusion by Bindu Ananth and Malavika Raghavan in Mint, June 7, 2017. The crisis of expertise by Tom Nichols in Aeon, June 6, 2017. Policing by consent: The reassuring face of the British police in trying times by Prasun Sonwalkar in Hindustan Times, June 6, 2017. Where schools struggle, students seek out English themselves by Aman Sethi, Heena Kausar and Saumya Khandelwal in Hindustan Times, June 5, 2017. Britain's Secret Weapon Against the Nazis? Refugees by Simon Worrall in National Geographic, June 4, 2017. What Winston Churchill and George Orwell had in common by John Gray in NewStatesman, June 4, 2017. Indian Council of Social Science Research: Past, present and a troubled future by Ramachandra Guha in Hindustan Times, May 28, 2017. Loan Waivers Are Duds: India Needs An Exit Policy For Unviable Farming by R Jagannathan in Swarajya, March 20, 2017. Grey market for IPOs: A case for regulation? by Suranjali Tandon in NIPFP Blogpost, June 2, 2017. Downgraded China Doth Protest Too Much by Benn Steil and Emma Smith in Council on Foreign Relations, May 31, 2017. Masha Gessen in the New York Times: 'incompetence and autocracy are not in opposition: They are two sides of a coin'. Why India's growing religiosity is an economic challenge by Pramit Bhattacharya in Mint, May 31, 2017. The Politics of Clan: The Adventures of Jared Kushner by David Brooks in The New York Times, May 30, 2017. The Loneliness of Donald Trump by Rebecca Solnit in Literary Hub, May 30, 2017. The severity of the NPA crisis by Harsh Vardhan and Rajeswari Sengupta in Mint, May 30, 2017. Dealing with protests in Kashmir: The army chief has spoken. Why is the prime minister silent? by Saikat Datta in Scroll, May 30, 2017. The Aadhaar legal framework is broken by Vrinda Bhandari and Renuka Sane in Mint, May 30, 2017. Czeslaw Milosz's Battle for Truth by Adam Kirsch in The New Yorker, May 29, 2017. Minerals as a shared inheritance: Implications for public finance by Rahul Basu in NIPFP YouTube Channel, May 29, 2017. Wall Street's Endangered Species: The College Jock by Justin Baer in The Wall Street Journal, May 25, 2017. The Virus Hunters by Jeffrey Marlow in Undark, May 25, 2017. How the Nazis Made Art Fascist by Ian Beacock in New Republic, May 23, 2017. There has been no Aadhaar 'data leak' by Ram Sewak Sharma in The Economic Times, May 9, 2017. Why Arendt Matters: Revisiting "The Origins of Totalitarianism" by Roger Berkowitz in Los Angeles Review of Books, March 18, 2017. What It's Like to Live in the World's Most Polluted City by Melody Rowell in National Geographic, April 26, 2016. The Spread of Dengue in an Endemic Urban Milieu: The Case of Delhi, India by Olivier Telle, Alain Vaguet, N. K. Yadav, B. Lefebvre, Eric Daudé, Richard E. Paul, A. Cebeillac and B. N. Nagpal in PLoS ONE, January 25, 2016. You Can't Trust What You Read About Nutrition by Christie Aschwanden in FiveThirtyEight, January 6, 2016. We in Economics would do much better if we understood how much these problems afflict us also. Professor Who Learns From Peasants by Jennifer Schuessler in The New York Times, December 4, 2012.